At V12, our most important concern is making safety footwear comfortable. the only multi-purpose sole with a 4 Star GRIP rating and a Keymark safety accreditation. Most multi-purpose safety boots boast a 2 Star GRIP Rating at very best. With the Bison Boot's IGS sole, we can now offer a 4 Star GRIP Rating - the only multi-use sole that can offer such comfort on the market. The intelligent grip system is a revolution in sole design. 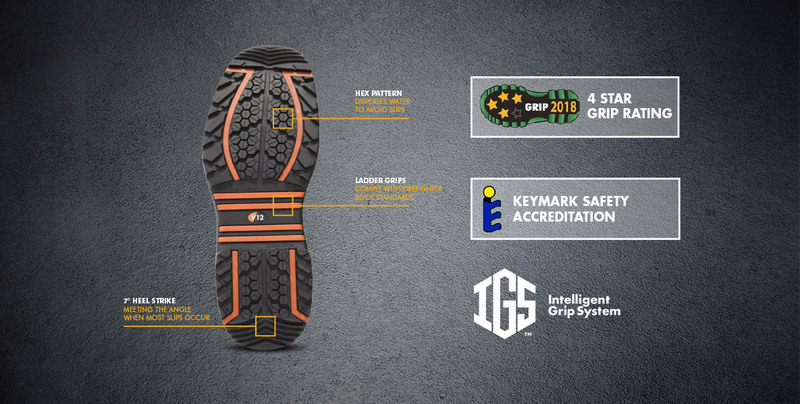 Inspired by car technology and made from highly durable rubber, the IGS features a unique hexagonal tread ensuring superior traction, ladder grips offering advanced levels of safelty and re-designed heel strike pad delivering exceptional water dispersal.